There’s hardly a gadget that can’t be automated these days, especially in the realm of home appliances. From locks to lights and security cameras to speakers, homeowners love the convenience of this new technology. In fact, many experts project the industry to grow to a $121.73 billion business in the next five years—and for good reason. Smart homes are not only more convenient and more energy efficient, they’re also just plain cool. It’s easy to feel like you’ve stepped into a Jetsonian future when you’re able to unlock your front door for a workman from the other side of town. Whether you are still considering your first smart home feature, or your entire home is now interconnected, it’s crucial that your home be just as secure as it is smart. Unfortunately, several studies have shown that industry growth has sometimes been more important than maintaining adequate security measures. In fact, the security firm Synack found that they were able to hack into certain devices in as little as five minutes, which allowed them to listen and see anything going on within a given home. Thankfully, homeowners don’t have to choose between an automated home and security, because with these easy tips, you can have both. A massive internet breach last October of the cloud-based internet performance management company Dyn left millions of homeowners open to hackers simply because their smart home devices were still using a standardized manufacturer’s password. A strong password is going to be your first line of defense against any cyber attack, so be sure to use a unique and complex password for each gadget. Apps like 1Password will not only generate random, virtually unhackable passwords, but will give you a single location to retrieve each one so you don’t have to worry about forgetting. 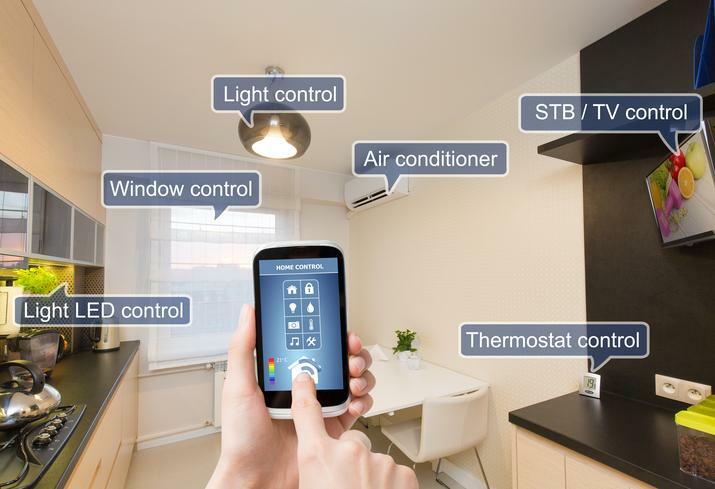 When most homeowners start considering home automation, they are usually in the market for one specific item and don’t take the time to consider their long term goals. That’s why many homeowners now have too many devices that are unable to communicate with each other and end up needing to purchase a smart home automation hub in order to streamline their lives. If you find yourself in this situation, make sure that any hub you choose doesn’t come with a hardwired and unchangeable password. Most of the big name companies are going to be your best bet, even if they end up costing you a bit more up front. Smaller startups are notoriously bad for not taking the proper security measures needed in order to keep their customers’ information secure. Most of us now have virtually all of our personal information somewhere out there on the internet, and that only increases when you have smart devices that can learn exactly how you live each day within your own home. Gadgets that are hardwired into the internet rather than relying on your personal WiFi network are typically going to be far more secure than a personally-managed automated device. Though this will require a monthly service fee, they are usually nominal and well worth the investment. Don’t rest on your laurels with this added security, though. It’s still necessary to have a sophisticated password and a multi-factor authentication system in place in order to verify your identity when changing your account. Routers have been described as the “digital doorway” to a home. Keep your router protected from hackers by choosing a company that is known for its strong focus on security, and change the default password before connecting any of your smart technologies to the network. Over the course of your router’s life, security coding will improve, and your router—and smart devices—will need to be upgraded in order to maintain adequate protection. Not all attacks are going to come externally, though. Keep your router safe from being compromised by storing it in a locations that’s not easily seen or accessed, especially if you have a device with a management port. By taking the appropriate steps to safeguard your home from cyber attacks, you can have the security you need within the automated home you dream of.